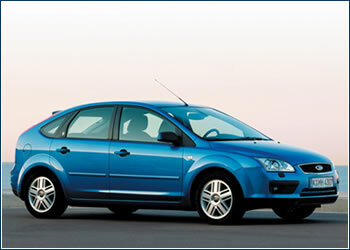 In the last six years Ford sold over four million Focus-line cars. The new, second-generation Focus makes no bones about its ambition to be a best-seller in its class. 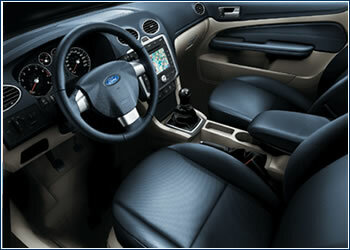 THE NEW FORD FOCUS comes as a 4.34 meter-long three-door or a five-door hatchback, and also as a 4.47 meter five-door station wagon. Its slightly extended wheelbase and widened track allow even greater stability and refined handling, making this car its class leader in this regard. Multi-element rear suspension plays a large role in this, as do very effective brakes, with an ABS anti-block system and EBD electronic braking force distribution, both standard equipment. On the Czech market the three-door Focus is available with four levels of options (Ambiente, Trend, Sport, and Titanium) and among the five-door models is the luxuriously fitted Ghia. Available engines start with four-cylinder, 1.4-liter and 1.6-l gasoline powerplants (80 and 100 hp – 59 and 74 kW), and the 1.6-l motor can be mated to a four-speed automatic gearbox. The second-level Trend comes with a 1.6-l engine tuned to 115 hp (85 kW), while the Sport, Ghia, and Titanium models have four-cylinder, 2.0-l engines (145 hp – 107 kW) that can drive the new Focus up to 206 km/h.The Ambiente and Trend models are available with 1.6-l and 1.8 turbodiesels (90 and 115 hp – 66 and 85 kW), and the Sport, Ghia, and Titanium models with top-of-the-line 2.0 Duratorq TDCi diesel engines (136 hp – 100 kW) and six-speed transmissions. These reach speeds of 203 km/h and boast combined consumption of just 5.5 liters of diesel fuel per 100 km. New Focus prices start at CZK 414,990 for three-doors, CZK 427,990 for five-doors, and CZK 462,990 for station wagons; the top version of the Titanium, with the 2.0 l turbodiesel, costs CZK 719,990 (three-door), CZK 734,990 (five-door), and CZK 769,990 (station wagon).